Keystone Compliance is a fully-compliant EMC/EMI/RF lab with the expertise and experience to assist manufacturers in meeting their regulatory compliance needs. What differentiates Keystone Compliance from other EMC labs are its staff, technical capabilities, facility and equipment. Staff: Keystone Compliance is an accredited laboratory with a staff of engineers and report writers with the technical expertise to meet testing requirements with thoroughness, accuracy and efficiency. The staff at Keystone focuses on proactive communication with the customer. Our engineers understand the importance of providing technical feedback and detailed reports with quick turnaround times. Technical Capabilities: Keystone Compliance’s specific EMC/EMI/RF testing capabilities include radiated emissions measurements in the frequency range of 10 kHz to 40 GHz and radiated immunity / susceptibility capabilities of 10kHz to 40 GHz up to 200 volts/meter. We also provide surge testing to 10kV/10kA and higher, ESD testing up to 30kV and shielding effectiveness with wide dynamic range to 40GHz. Facility: Customer comfort is a priority of Keystone Compliance. The facility is a 20,300 sq. ft. building completely renovated in 2011, located on a three-acre campus. The lab space is brightly lit, temperature controlled and features a spacious customer lounge with individual workstations, WiFi and numerous other amenities. 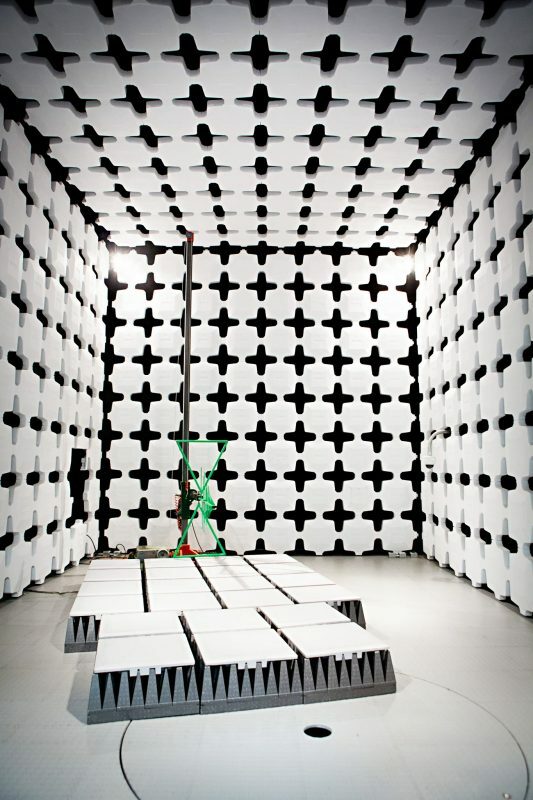 Equipment: Our EMC/EMI lab is highlighted by five test chambers, including two anechoic/ferrite lined 3-meter chambers and three semi-anechoic EMC test chambers. A double-door entry into a 32’ by 20’ semi-anechoic chamber with an 8’ turntable allows us to accommodate oversized equipment. The two three-meter chambers have oversized doors as well.